Thank you Margaret O'Brien for featuring me in yesterday's 'Made in Ireland' article in the interiors section of the Sunday Business Post Magazine! As plans progress for 'Creative Island' at Showcase 2015 it's good know that I'm heading in the correct direction with my naturally printed felt throws and large squishy feather filled cushions. This month I'll be felting like crazy and also printing heavy quality silk and wool yardage ready to be sewn into more of the cushion covers. Luckily I have an excellent seamstress living locally, if I didn't I'd be in a bit of a state by now, sewing really isn't my forte! 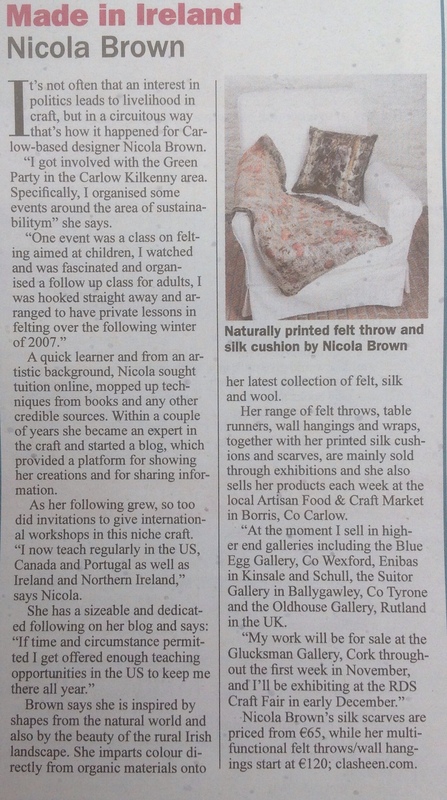 This entry was posted in pre, Press and tagged Felt, interior accessories, interiors, Margaret O'Brien, silk, Sunday Business Post by Nicola. Bookmark the permalink. Nicola awesome article! Kudos! I printed it off! Nicola, you’re amazing and I got inspired from you. You deserve for the exposure !